New interior design contest on Desall.com: Enel relies on the community of Desall for conceiving a creative space dedicated to its employees, to facilitate the generation of innovative ideas in line with its mission. For this contest the voting phase will be open only for the Sponsor. Enel is a multinational power company and a leading integrated player in the world’s power and gas markets, with a particular focus on Europe and Latin America. Enel Group operates in over 30 countries across 4 continents, producing energy through a net installed capacity of nearly 90 GW and distributes electricity and gas through a network of approximately 1.9 million kilometres. This brief is also available in Italian ( Download ). Start creating your inspiration wall using the Inspiration tab and get inspired by the hints of other creatives! In line with its Open Power mission, for Enel sustainability is a goal to achieve through innovation processes. For this reason, Enel relies on Desall for researching new concepts to employ for the design of a space dedicated to creativity at the company venues in Rome, in order to realise a highly stimulating and human-centred environment, where the People of Enel may meet up and generate ideas, giving life to “innovative” projects. Such initiative is based on the strong belief that the environment is ever more an active and enabling aspect for innovation and sustainability and, thus, for change. Objective of the contest: you are invited to propose interior design concepts to setup a multifunctional area devoted to creativity, where one may perform several types of activities aimed at stimulating the generation of ideas and accordingly the creation of innovative projects. -	Events (various activities related to creativity and innovation, that involve all the attendees). Target: the creative area shall be conceived from a human-centred standpoint, setting up an environment where the People of Enel may feel at their ease and find a place where getting inspired and generating new ideas. Design area: the area you are invited to work on consists of two rooms, a large one (Creative Room) and a small one (Pitch/Meeting Room), accounting for about 114sqm altogether. The area is not on a top-floor position and there are no outward facing windows. The inner height is equal to 2,65m. The area shall accommodate up to 40 people (30 people for workshop/prototyping sessions). Next to the Creative Room there is a Fab Lab (which is not the subject of the contest), to which one should have nevertheless easy access from the Creative Room. For more info, see the plan attached in the Material files. Creative Room: it represents the main area, where one should be in the condition to perform all the various activities. The glass-wall (A) constitutes the main access to the room, through a sliding door (B), which is also made of glass, thus enabling the Creative Room to be visible from the outer corridors. The opposite wall (F) might be either realised in masonry or glass. Besides, the Creative Room shall grant easy access to the adjoining Fab Lab (which is not the subject of the contest): you are thus invited to think how to realise the wall (G), meant for separating the spaces, also inserting a door/passageway/etc. that will enable people to easily move from one space to another. As indicated in the plan attached in the Material files, there are 4 pillars (C) inside the Creative Room. Pitch/Meeting Room: it is an area mainly reserved for pitches, presentations, meetings. One can access this room both from the Creative Room, through a sliding door (E), and from the outer corridor, through another sliding door (D). For more info, see the plan attached in the Material files. Elements in support of creativity: from a survey carried out on a sample of Enel employees, it appears that some elements play a fundamental role in inspiring and stimulating creativity. -	Bookshelf, useful for sharing books about innovation and creativity and for storing materials useful for brainstorming and prototyping. Besides, the interviewees have expressed their interest to have a space that does not remind of the Enel offices. Furnishing items: in order to furnish the area of the Creative Room and of the Pitch/Meeting Room, you are invited to employ tables, chairs, sofas, poufs, black/white-boards and all the elements you deem more appropriate to facilitate at best the various activities, while stimulating creativity. While making your choice, be inclined towards modular and movable furniture. In fact, take into consideration that in case of events, the main elements of the Creative Room might need to be removed and the area be prepared to accommodate up to 40 people. The furnishing items you suggest shall allow an easy re-arrangement of the spaces, depending on the activity, also by possibly employing movable walls/wall dividers that might enable one to create new spaces (at your sole discretion). Materials: in the various furnishing elements you propose, you are invited to employ eco-friendly or waste materials, preferring locally sourced items (Made in Italy) to minimise the environmental impact associated with transport. The materials you choose shall also guarantee a long lifecycle and the minimum production of waste. Technologies: in order to ensure that all the activities can be properly carried out, you are required to provide all the rooms with an audio system. You should also provide an appropriate number of floor sockets, to use when needed. Also equip the rooms with a comprehensive video-projection system – it will be greatly appreciated if the main room is also enabled for floor video projection. At your discretion, you are free to propose the employment of other innovative technologies, i.e. virtual reality (VR), augmented reality (AR), interactive walls, etc. Deliverables: in order to better present your project, you are required to submit renderings and layouts. A rough estimate of the costs would also be appreciated. If you want to attach further materials (DWG, PDF, presentations, technical sheets, etc. ), you might include them inside a .zip archive to attach from the upload form. Participation is free of charge and open to designers and creative talents of any nationality aged 18 years or older. Participants can present one or more projects, but only the projects published on the www.desall.com web site, via the upload page related to “Enel Creative Space Award” will be accepted. The selection of the winner will be the result of an unquestionable evaluation by Enel. In the evaluation of the projects, the following criteria will be taken into consideration: technical feasibility (30%), sustainability (25%), innovation (25%) and economic feasibility (20%). It will also take into account originality, feasibility and consistency with the brief. For the duration of the option right, the Sponsor offers an extra chance to all participants setting a price of Euro 2,000.00 (two-thousand/00) for the purchase of the license for the economical exploitation of the projects not-acknowledged as the winning proposals. For more info, please login and read the Contest Agreement from the upload page. Since we are an international Community, all texts provided with your uploads (abstract, description, tags, etc.) should be written in English. 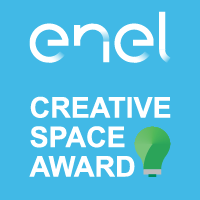 Do you want to stay updated about "Enel Creative Space Award"? Sign up in Desall, save the contest in your favourites and edit the notification preferences in your account. Minimum 1 image, up to 5.
allowed resolution: 72 dpi ; max file (for each one) size: 1 mb.